Step into timeless nautical style shoe that can take you from AM to PM in comfort. 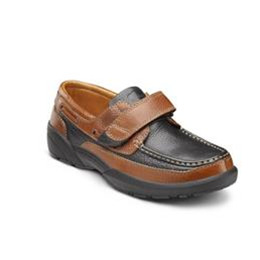 The Dr. Comfort® Mike upgrades a classic boat shoe with high-quality leather for a casual, relaxed look. Lightweight and comfortable, the Mike features a padded heel and tongue to help prevent skin irritation while the wide toe box helps protect the toe from stubbing. Designed as an easygoing slip-on casual shoe, the Mike offers a contact closure strap allowing you to customize the fit. Whether tooling around at home or heading to a social gathering, the Mike delivers a comfortable, casual look. Single hook and loop fastener for comfort, support, and a great fit. Natural material to help regulate heat and keep feet cool and dry.